Network Connections Group USA is one of the leading suppliers of global data communications specialist products making any cabling project trouble free with better products, design, and value, supplying the best and most cost-effective products for cabling in the world. We are the cabling legends that have supplied and installed in all parts of the world on land, sea, air, and space. We may not have installed in Space, but we do supply NASA, SpaceX, Lockheed Martin to name a few. We sell the best cables labels and we are the guys who have worked in the cabinets all night labeling the cables and patch panels. We support our clients from start to finish of your projects and our products are installed on the top cruise ships around the world in areas from the USA, Canada to Europe. Suitable for all standard office laser printers. Cat 5, Cat 6, USB, Thin VGA, CCTV Applications, RJ6, RJ11 Ideal for Cat 5/6/7 and Cat8 cabling. Our Cable Label products are cost-effective and Made in the USA to provide the best solutions for your projects. They are made from the highest quality self-laminating wrap around materials and can be printed on any standard office laser printer. They are self-adhesive with an opaque section which laminates the printed area. These products are used by our own Technician’s every day and we have thousands of patch cord labels installed all over the world. Tech Cable Labels is our own brand of labels for the structured cabling and communications cabling market, we have taken our electrical engineering and low voltage knowledge to design and manufacture the best performing and economical labels around today. Our range is now growing for the structured cabling market with our Patch Panel labels, fiber tags, engraved labels, data jack labels and self-laminating cable labels all made to the same high quality that you have come to expect. 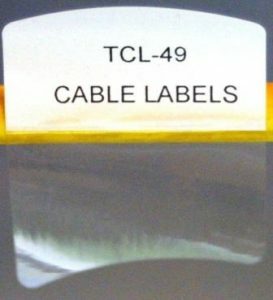 Our new TCL-49 are designed for data communications cabling, these TCL-49 self-laminating cable labels have our new curved top edge to help the installation onto the cables in tight racks for the cable labels are great for patch cords and telecommunication cables. They are designed by Technicians and made from the same high-quality material as our standard wire labels, these new and easy to install and can be printed on any office laser printer and have great results for patch cord labels and cable marking for electrical and data. We understand structured cabling labeling and have many years experience of the best wire markers and self-laminating cable labels across the world in many projects from small structured cabling systems to cable marking on the top rated cruise ships, railways, and NASA. Tested by Cabling technicians and printed with our FREE web-based labeling software totally free and no sign-up www.printmycablelabels.com we are network labeling experts and only use solutions that work. Design and print your wire markers online for perfect results, with our state of the art web based labeling software printing can be used any place from any device, no need to download or spend money on labeling software which is always out of date. Our web-based network labeling software service is growing every month and allows you to print our products for free, no more download and PC’s just click and print. Our cable markers are great for patch cord labels and all structured cabling installations, cabling for all networks with many labeling solutions from data centers to the small office networks, they stay for every and the self-laminating cable labels are installed all across the world on large-scale projects. Network Connections Group USA has responded to a unique opportunity in the Computer Communications Services marketplace, supplying hardware & software expertise. We provide a complete solution to all aspects of services related to Networking data & voice communications requirements. Our technical experts will discuss your Networking requirements and suggest a solution. Structured Cabling is the backbone of any business. As modern business becomes increasingly data and bandwidth- intensive, businesses need a scalable, reliable and high performing structured cabling infrastructure. Having a robust and scalable IT cabling foundation can significantly impact your bottom line. High performing infrastructure can increase sales, decrease operational costs and improve product quality through the high-speed and reliable delivery of business-critical information within and across businesses.